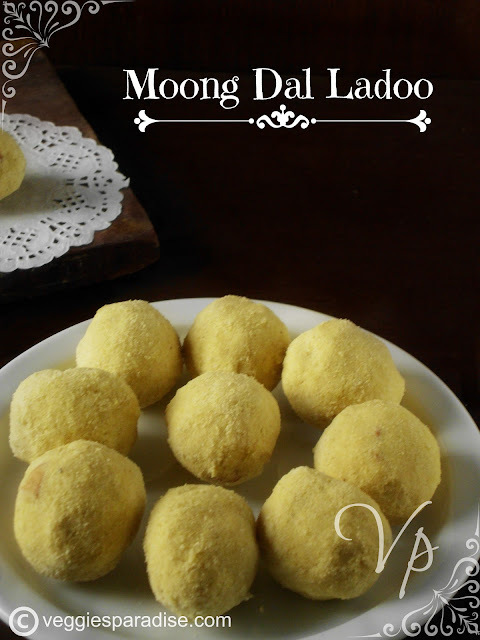 MOONG DAL LADOO - A delicious and healthy ladoo's with moong dal. This is a traditional sweet of South India , which is prepared during festivals. This is prepared with moong dal, sugar, ghee, cashews , cardamom powder and the combination is out of this world ! Grind sugar to a fine powder and keep it aside. Dry roast moong dal until aromatic, remove from heat and allow it to cool.Grind it to a fine powder. In a bowl, add powdered moong dal, sugar, cashews and cardamom powder. Mix it well. Heat the ghee and fry the cashews until golden brown. Now pour the hot ghee to the mixture and mix gently with a laddle. When the heat becomes bearable,take a handful of it and roll them into small lemon sized ball. Repeat the same with the remaining mixture. If you find difficult to make balls, add little hot ghee and try out. 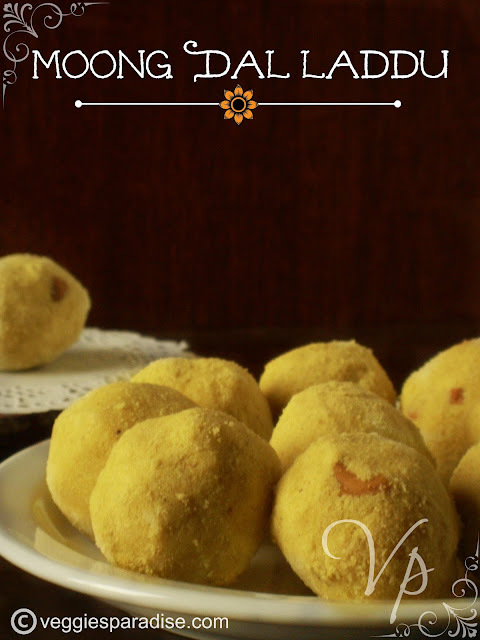 Healthy ladoo, inviting clicks dear!!! Very tasty and delicious moong dal ladoo. Wow.. Looks so yum. 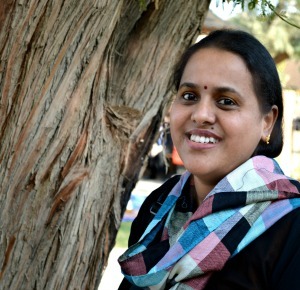 Nice clicks aruna. Sounds so easy Aruna; very tempting too. They look perfectly done, has been a long time since I tasted one.. It is a very healthy snack sweet. My grandmom made these with whole moong, roasting a bit and grinding with the skin. Yours look lovely and thanks for reminding me of those. Pasiparippu ladoo looks really yumm. very delicious and healthy ladoos for kids...u have shaped them so well...nice clicks!! 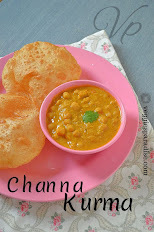 we do make it the same way,mouthwatering recipe with inviting clicks..
telugu name,looks perfect.Drop into myblog when u are free. ladoo looks very inviting dear. Great clicks. One of my fav laddoos, feel like having some. Moong dal Ladoos looking yummy.Great space happy to follow you.